Ex-Lufthansa A321 joins Luftwaffe (German Air Force). 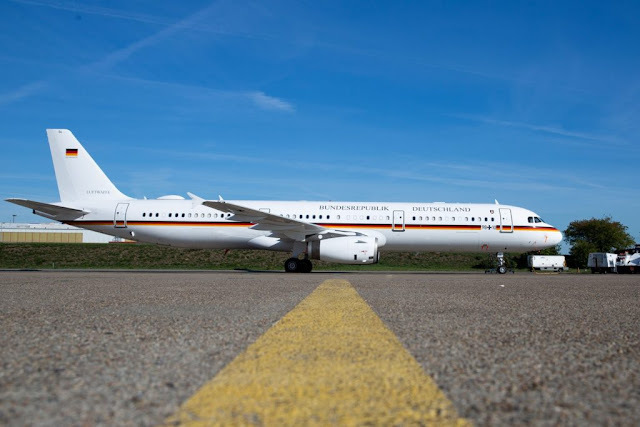 Sept. 21, 2018 - Lufthansa Technik AG handed over a converted Airbus A321 to the German Armed Forces in the presence of Vice Admiral Carsten Stawitzki, National Armaments Director of the Federal Ministry of Defence (BMVg), and Gabriele Korb, Director-General of the Federal Office of Bundeswehr Equipment, Information Technology and In-Service Support (BAAINBw). In addition to military missions, the aircraft is also used for political/parliamentary purposes. "Past experience has already shown that joint projects between Bundeswehr and Lufthansa Technik have always been implemented very professionally and smoothly," said Constanze Hufenbecher, Chief Financial Officer of Lufthansa Technik. "We are delighted that this tradition has continued with the conversion of this aircraft and that we have been able to keep the cost and time schedule". She added: "I would like to thank our partners from the Federal Office of Bundeswehr Equipment, Information Technology and In-Service Support for their trust and wish the Special Air Mission Wing of the Federal Ministry of Defence "always happy landings" with this A321. At the same time, I would like to explicitly thank our employees for their great commitment. They have thus made a decisive contribution to the successful completion of this project". The new aircraft cabin is strongly based on the modern and functional design of the Airbus A319 and A340 of the BMVg's Special Air Mission Wing, which are already in flight operation. Therefore a similar layout as well as the same materials and surfaces were used. The cabin is divided into different areas for government members and their staff, as well as for accompanying delegations.